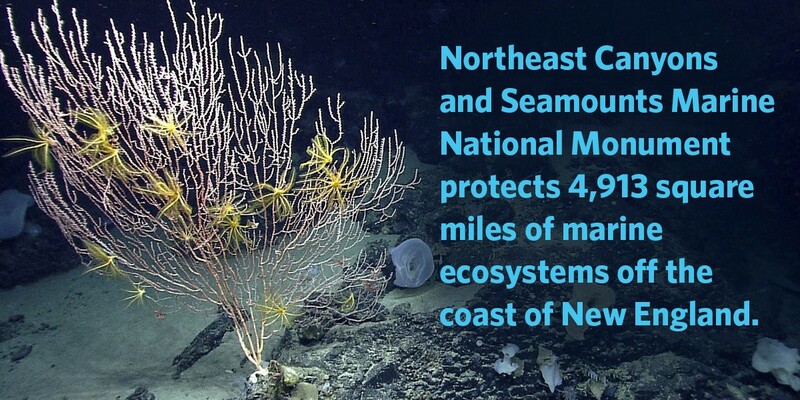 Today, President Obama designated the first marine national monument in the Atlantic Ocean, protecting fragile deep-sea ecosystems off the coast of New England as the Northeast Canyons and Seamounts Marine National Monument. The new national monument — which encompasses pristine underwater mountains and canyons — will provide critical protections for important ecological resources and marine species, including deep-sea coral and endangered whales and sea turtles. 1. It’s smaller — approximately 5,000 square miles — but significant. Although smaller than the President’s recent, nearly half a million square mile expansion of the Papahānaumokuākea Marine National Monument off the coast of Hawaii, this new monument in the Atlantic is just as important. Considered a hotspot for biodiversity, its boundaries were narrowly tailored according to the best available science and stakeholder input. 2. It has some seriously intense topography. Within the boundary lines of this new monument are four massive, underwater mountains — called “seamounts” — and three gigantic canyons. These canyons, deeper than the Grand Canyon, make the monument ripe for future scientific exploration and discovery. 3. This monument is — quite literally — like nowhere else on earth. In addition to playing home for rare and endangered species, like sperm whales and Kemp’s ridley turtles, this monument is also home to coral species that are found nowhere else on Earth. 4. The monument will help build the resilience of a unique ecosystem — as well as combat climate change. The health of our oceans is critical to the health of our overall planet. It’s ground zero for our food chain and absorbs heat from our rapidly warming planet. A healthy ocean will be better equipped to keep our planet healthy. 5. It builds on President Obama’s committment to conservation and combating change protection. Since taking office, President Obama has sought to lead the world in marine conservation by taking bold action to protect our ocean and marine ecosystems. In addition to protecting more land and water than any administration in history — including creating the world’s largest marine protected area — President Obama has taken many steps to combat illegal fishing, revitalize the process for establishing new marine sanctuaries and promote ocean stewardship through the use of science- based decision making. 6. It is setting an example — and the world is following. Thanks in part to the strong example set by President Obama and the United States, more than 20 countries attending the Our Ocean Conference announced the creation of 40 significant new marine protected areas, totaling nearly 460,000 square miles of ocean. When combined with the Papahānaumokuākea expansion, the nations of the world have protected more than 900,000 square miles of ocean in 2016, exceeding last year’s record of more than 730,000 square miles. 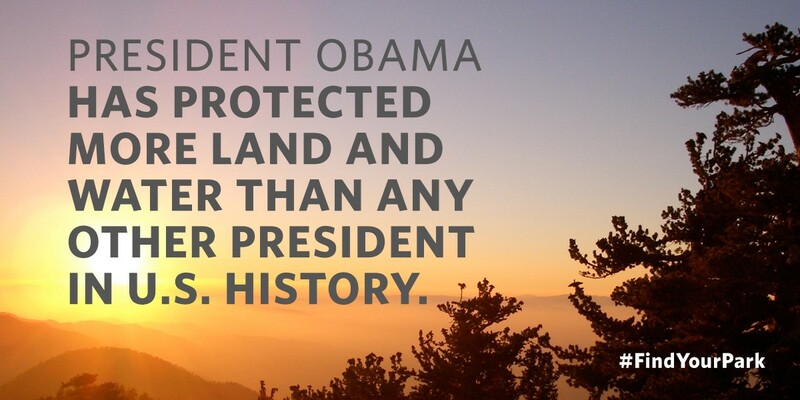 Learn more about President Obama’s record on conservation.